Curved interchangeable metal corridor signs include clear, non-glare protective lenses that can be easily removed to switch graphics in and out of signs. 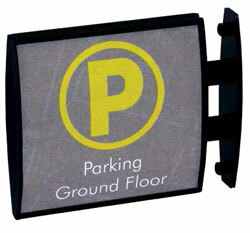 Metal frames are curved from top to bottom and are available in a satin silver anodized or black powder-coated finish. Choose from black or grey durable plastic end caps and a variety of sizes. 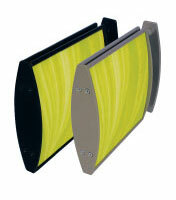 Mount these double-sided signs on the wall above exam rooms, restrooms, conference rooms, classrooms and more. 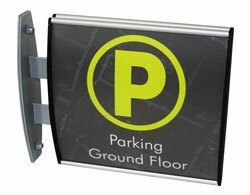 These signs sit perpendicular to the wall and can be read coming from either direction. 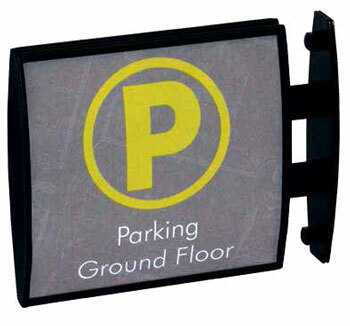 Sign face is curved from top to bottom and all signs include a matte clear, protective lens that can be easily removed with the help of a provided suction cup. This makes interchanging information quick and efficient. View a size chart here, to see standard sizes (with measurements) offered. 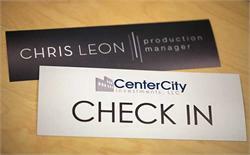 If you have any questions, contact our customer service team at service@officesigncompany.com or via phone at (701) 526-3835. Sign inserts are available for purchase here.